We’ve had a lovely cool and rainy streak this mid-May and it’s created some beautiful conditions in the mountains. 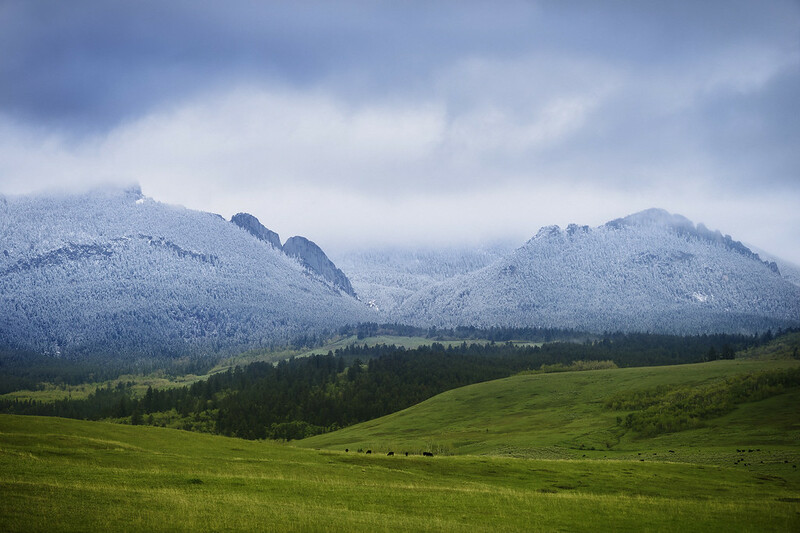 Snow is possible pretty much all year around in the Beartooth Mountains, especially at higher elevations, so I wasn’t surprised to see a light dusting of snow and frost on the foothills of the Beartooths outside of Red Lodge Montana. It made for a magical scene with cold and foggy conditions in the mountains, obscured by clouds, while the lower meadows are a lush green, complete with grazing cattle. Montana is sure beautiful! We can’t get enough of it! Tips for photographers: This photo was made next to Highway 78 North of Red Lodge with a 135mm lens on a full frame Sony A7ii body. Montana makes for easy pickings sometimes, you just have to pull over and that’s about it. I prefer a longer lens for my “side of the road” landscape photography because it allows you to isolate a more narrow scene and eliminate distracting foreground elements that you otherwise can’t control because you’re stuck on the road and can’t hike up closer to search for the perfect foreground. So I tend to compress the foreground with a longer lens, either my 135mm or 70-200mm. The 135mm is lighter and smaller so it’s almost always in my bag. I am Billings Montana wedding and portrait photographer Paul Bellinger. Please visit www.paulbellinger.com for wedding and portrait bookings.